Democratic Presidential Candidate, Hillary Clinton has named Senator Tim Kaine of Virginia as her Vice-Presidential running mate. A look into Tim Kaine’s past positions on immigration reveal that he has supported steps towards reforming America’s immigration system, has spoken out against punitive, anti-immigrant measures at the state level, and has made significant efforts to reach out to the immigrant community. 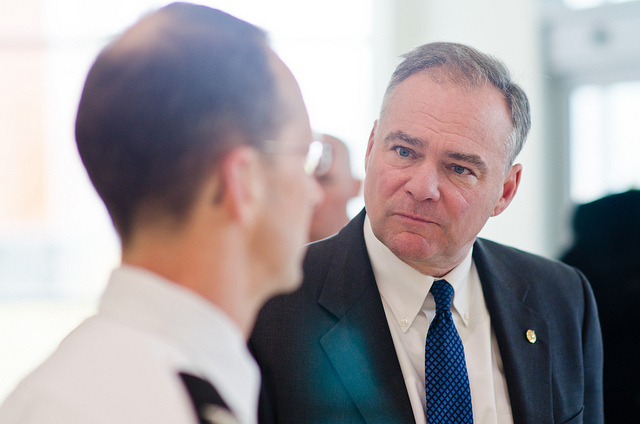 Tim Kaine also supported the DREAM Act and as a Senator voted yes on S. 744, the last immigration reform bill to pass the senate. He also famously gave a floor speech on the need for immigration reform in fluent Spanish while the debate over the legislation waged. Earlier this year, he participated in the DAPA dinners campaign where he shared a meal with a family who would be eligible for these deferred action initiatives in an effort to bring attention to the needs and struggles of mixed-status families. For far too long, our immigration system has placed undue burdens on legal immigrants and kept millions of others living in the shadows of our society. I support a bipartisan approach to immigration reform that will provide a better visa system to encourage growth of a talented workforce, enhance our border security, create a path to normalizing the legal status of those here unlawfully – following compliance with various requirements such as payment of taxes and a fine – and establish a better system for companies to verify the immigration status of their employees. According to the New York Times “Mrs. Clinton and Mr. Kaine have similar positions on the issues and they are said to share an easy rapport and a love of granular policy-making.” It also seems Ms. Clinton has found a running mate whose current thinking on immigration policy aligns with hers.